They say that imitation is the best form of flattery. For some, perhaps. The saying holds true in industries such as fashion, no doubt. But when it comes to blogging and a writer’s intellectual property, I would strongly beg to differ. It is only flattering when a person imitates an author’s manner and flow of writing, but when a writer’s actual text is copied, regardless if it is altered ever so slightly, that particular form of imitation is nowhere near flattery. It infuriates! Because, my dear readers, the deed becomes downright PLAGIARISM. You’re all probably asking yourselves, “Why is The Tummy Traveler saying all this?”… Well, I’ll tell you why. Earlier today, I was going through the net Googling a few things related to my blog. It was just one of those ordinary routine tasks I do to make sure my blog is in tip top shape for all you guys. Google suddenly showed me search results that led to a site with the same title as my blog! Coincidence, maybe? The URL was “http://thetummytraveler.wordpress.com“. I thought nothing of it at first. But I got curious and clicked on the link. This was the banner of the site that popped up. I was pretty weirded out already, considering we eerily shared the same title and that the site’s banner image was a bit similar to mine – it had images of utensils and an airplane. It doesn’t take a genius to know that the owner of the site blatantly copied my HOME text! Sure, there were a few changes in the words and a few sentences were omitted, but nevertheless, these alterations were obviously made to deceitfully make it appear as though it wasn’t a ripoff! It doesn’t stop there, unfortunately. As I scoured through the creep’s blog, I discovered more of the same! Unbelievable, right?! The gall to actually steal someone else’s work and think that he/she could get away with it! So, who exactly is the owner of this website who has maliciously stolen someone else’s work/ideas and passed them off as his/her own? Boy, is she going to hear an earful from me very soon. 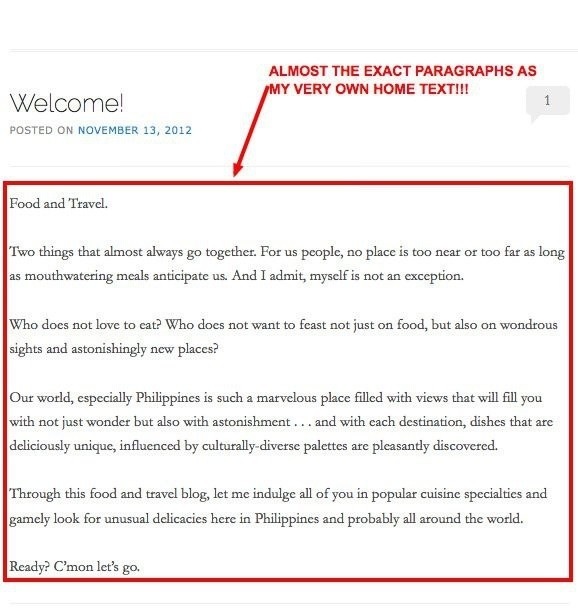 If you’re infuriated with stupid people that have nothing better to do than plagiarise left and right just to make a mark on the blogosphere, I would suggest that you email Ms. MC as well and give her a piece of your mind. I will keep you all posted as to how this all plays out in the coming days. So, make sure to stay tuned. I am reeling with so much anger right now, I wanna punch a chubby wall. Grrrrrrrr! Of course! Let everyone know that jerks like these actually do exist and SHOULD be humiliated for their malicious actions. Shame on her! How did you find out about her? Hope it gets worked out soon! Accident lang that we discovered about it. Stumbled upon it via Google. You should DMCA her na. I was also a victim of plagiarism two years ago. I deal with all sorts of copycats like this all the time. I see that thetummytraveler.wordpress.com is using the free wordpress account. 1. Take screenshots of all the plagarized sections that the copycat copied. You’ve taken some i see but in this case you have to get THEM ALL. EACH AND EVERY plagiarized post, text or whatever must be copied. a.) Tell them that the offender is copying sections of your blog. 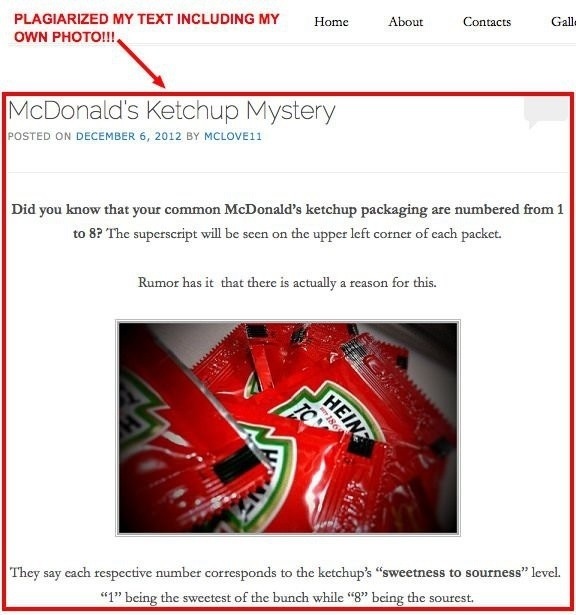 be sure to include each screenshot with a link back to the original article on your site. b.) Tell them that the person is CYBERSQUATTING (wikipedia) and that he is attempting to steal visitors from your site (which is a dot com). Tell them that the offender is using wordpress resources to commit fraud etc etc. You’ll find that the offending blog will be taken down very quickly. Have you considered making your text unable to be copied on your blog? All you need is a plugin: This is what I got from google..
Now you may want to research other alternatives or other versions of the plugin. After reviewing her site, I noticed that most if not all of her pictures are taken from someone else. She only started blogging in december so she may be a newbie blogger (one who doesn’t know the appropriate “netiquette”) OR maybe she is one who creates spam blog accounts in order to get paid. 1.) If you put up a design on the internet be aware that you are practically giving it away. 2.) It is similar to seeing a fancy dress in the window of a store and making the same dress for yourself at home. You may also want to do this to every article on her blog. COPY an entire section… PASTE IN GOOGLE.. Hit ENTER.. 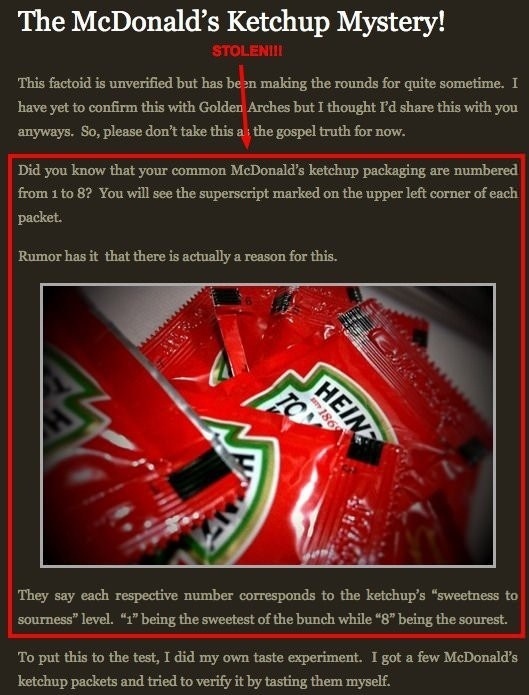 It just verifies my suspicion that this blog is a spam blog. I will share this, too! I hate people who steal other people’s works. Grrrr to the highest level. Same here. You invest time to work on it and someone just blatantly steals it. Sigh! Someone must have gotten a plenty of time to go over all of your contents and copied things in toto. 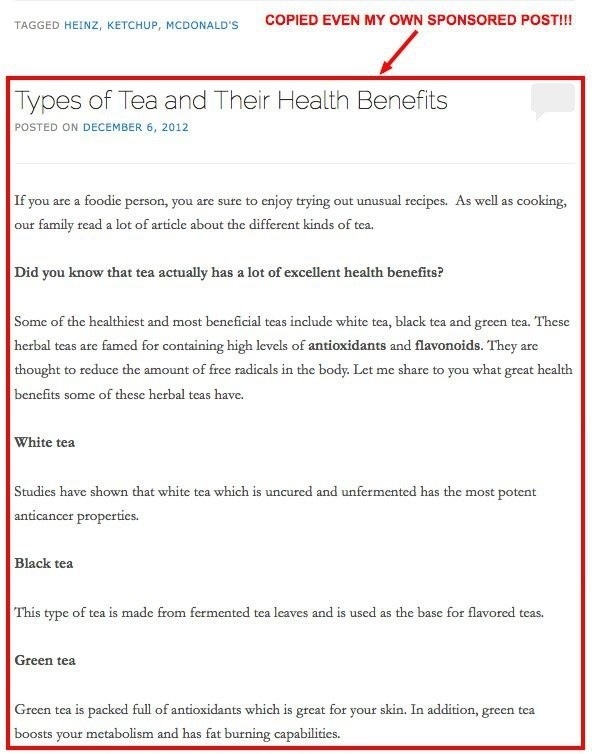 I would have thought that your blog entries were taken as full feed via RSS but no, even your pages were copied too. Report this to Google asap. Good luck! 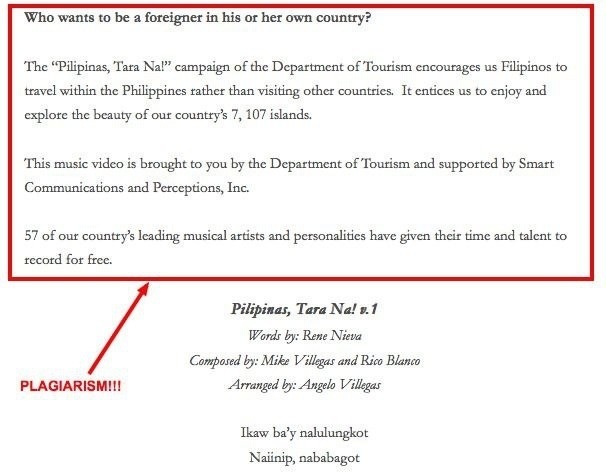 Uh oh, Ms. Frances ayan na naman, masyado raw kasing maganda and informative yung blogs ninyo kaya laging kinokopya. But seriously, is there really a way to protect others from stealing our works online? Kasi di ba sa photos may watermark, but our posts can be easily copied. 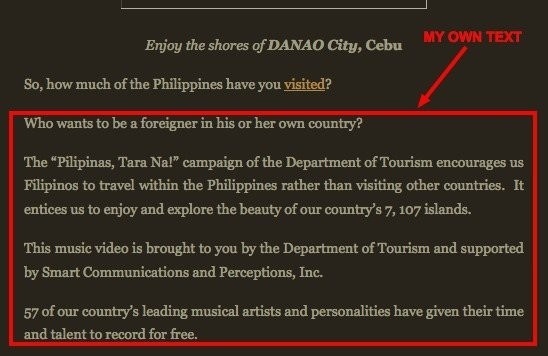 Mukhang “chop-chop” ang website ng MC na yan! Oh man this is so bad! We also advocate against these kinds of practices. We, along with a few of our friends have had problems with either getting the content word for word, or people editing our pictures, and then pasting their own logos on it. And to think these are corporate entities! Shared on FB and Twitter. 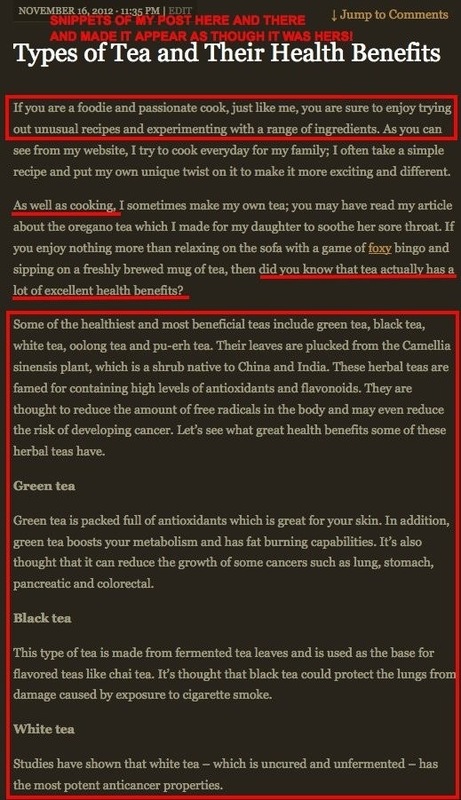 This copy cat must be a regular visitor of both blogs. Hope you catch the thief and skin her alive. Thanks! We can all have a piece of her para lahat masaya! LOL! Hi Rissa! Thank you for sharing it with your followers. I pray this doesn’t happen again and that it doesn’t happen to any of you guys as well. OMG Yen! That is sooooo annoying! We actually had an infringement case against a competing review center. My husband got weak-kneed when he saw that the review materials of this “review center” in Naga City were the same as ours. Pati examples ng nila, gamit pa ‘yung pangalan ng dobermann namin, ng town ni Mama, ng name ng dating pet shop ni hubby, etc. And then the people behind this so-called review center are washing their hands saying it was their staff who was responsible, when in fact we have an email from the proprietress that clearly indicates she was directing her staff’s plagiarism. Umiinit nanaman ang dugo ko. Grabe ano? These people think na ok lang. There should be heavier penalties for plagiarizers. Kumusta ang kaso niyo? Nahabol niyo ang mangongopya? Did you file a case against them? Oo. At first we filed a criminal case in Bicol. Supposedly may warrant of arrest na sya kaso for some reason may nakialam na mataas na fiscal at na-overturn. We went to the thr DOJ and the IPO and ayun, napilitan siyang mag-settle. Kasi malakas talaga evidence sa kanya e pag nanalo kami sa IPO malamang manalo rin kami sa DOJ. I hope this gets resolved. Balitaan mo kami ha? Before anything else happy birthday ! I have learned about your post through Martine De Luna as I am an avid follower of hers. It is so sad that some people are so blatantly proud of stealing intellectual properties. And that’s what exactly what I wrote on my wall when I shared your post. Hope this issues gets resolved soon. I have good news! The site is down now. There is no more tummy traveler.wordpress.com Thanks for following my advice. oops i typed in the wrong url.. But did you contact wordpress support? Hello, Thanks for your post. 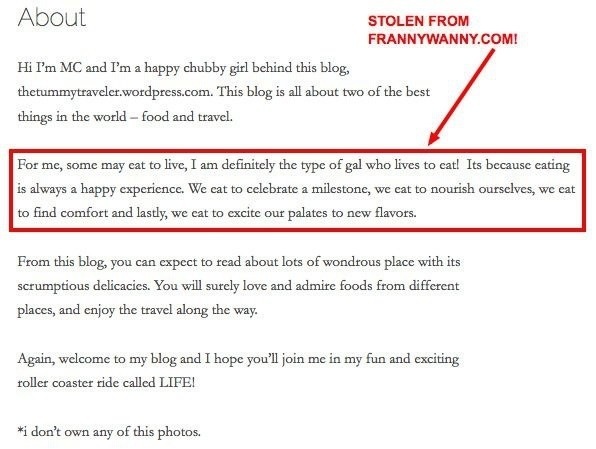 I am also a victim of this Tummy Traveller when a visitor to my blog ‘365 Great Pinoy Stuff’ accused me of plagiarizing the Tummy Traveler WordPress blog when it was mine that was copied. My post was dated September 10, 2010 and Tummy Traveler was January 13, 2013. 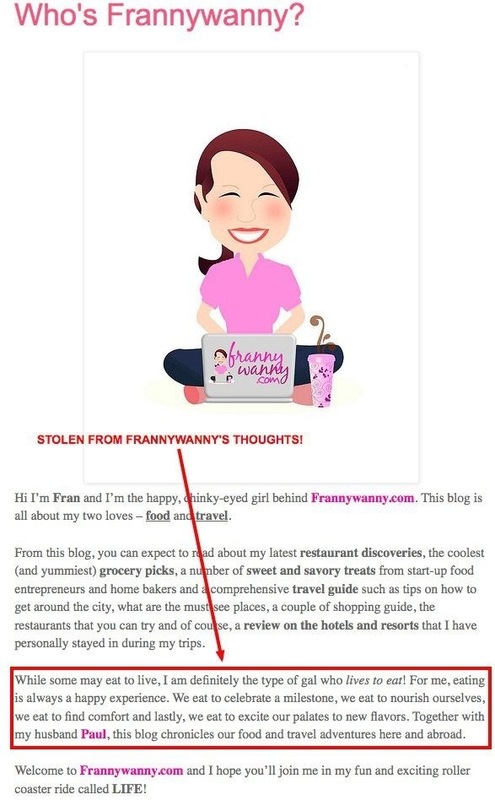 To my dismay, there were several other items (at least 6 blog posts) from my blog that were copied wholesale, including my own mistakes…I am taking this as a serious offence. someone copied your work without your permission and made it appear that the material is his own. this is copyright infringement. not plagiarism. the former is punishable by law, the latter is not. You are Here >> Home » Uncategorized » Plagiarized!